Fennel has always been used as a culinary delight as well as a medicinal herb. It’s been the most simplest and effective remedy for curing human ailments. Fennel is used as a mouth freshener; it cures poor digestion and aids your weight loss process. This herb is anti bacterial, anti inflammatory and an anti oxidant in nature. And the tea prepared with fennel seeds, leaves & bulb proves to be even more beneficial. Therefore here are few things you need to know before consuming the fennel tea on a regular basis. Cures Gastrointestinal Problems: Just with a single cup of fennel tea (or by gulping some fennel seeds) you can easily overcome the symptoms of indigestion & heartburn. Improves Digestive Health: Fennel relaxes & treats the irritable bowel syndrome. You start to digest food easily. And stomach cramps, bloating or diarrhoea gets excellently relieved. Women Health: Fennel has the capability of treating hormonal problems. It helps relieve the menstrual cramps. And also stimulate the production & flow of milk in lactating women. 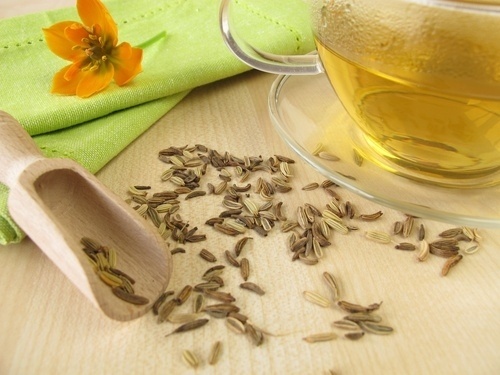 Relieves Colic: Fennel tea is absolutely safe for kids. It relaxes their intestinal tracts as well as the sufferings caused by colic. Purification of Blood: Fennel acts as a blood cleanser initiating a healthy urine flow. It improves the functioning of your kidneys & protects your liver from alcohol damage. Aids Weight Loss: Fennel tea proves to be effective for aiding your weight loss process. It boosts your metabolism, reduces cellulite and regulates the appetite. Boosts Immune System: The fennel infusion reduces fever, prevents the onset of cough & cold, relieves sore throat and clears up the congestion. It makes you immune system strong and disease free. Eye Health: This tea proves to be refreshing. It helps reduce the puffiness of your eyes along with treating certain eye infections. Heart Health: Fennel tea is wonderful in maintaining a healthy heart. It lowers your bad cholesterol and reduces the chances of hypertension. Gum Health: Daily gargle with fennel tea treats bad breath & relieves inflamed gums. Seeds: Gently crush around one teaspoon of fennel seeds to release its flavour, oil and the divine aroma. Scoop out the seeds, place them into a container and pour a cup of boiling water over them. Let the water sit for about seven to ten minutes and strain it for consumption. The refreshing, aromatic and restorative cup of your fennel tea is ready! Fresh Leaves: Choose the fresh, fine and green fennel leaves and rinse them well. Place the leaves in a container and fill the same with boiling water. Allow the water to sit for about 15 to 20 minutes and just remove the leaves before consumption. Fennel Bulb: Clean the fennel bulb well and chop it into small pieces. Add the pieces to a tea strainer, pour boiling water and let it steep for 15 to 20 minutes. Strain the tea and consume it thereafter. Remember that fennel comes from the family of carrots and celery. So be aware if you are allergic to any of these. It can cause itching, hives or swollen skin. Consult your doctor if you are on certain medications as fennel tea may react with the same and extremely enhance its effects. Drink the tea in moderation if you are prone to blood clots. Also, if you are an expectant mother, avoid drinking this tea as it may be toxic & can harm the system of your little one. Shubha is an Ayurveda enthusiast! Loves Yoga and Meditation! She is the founder of www.Ayurvedum.com and is on a mission to help everyone world over live a naturally healthy and balanced life by following an Ayurveda lifestyle. Ayurveda is the ancient wisdom of life from India dating back 5000 years that is as relevant even in the current modern society. Help spread the goodness of Ayurveda with her!